While always uncommon, the Dunlin undergoes a dramatic change in plumage between its spring migration through Tennessee and its return in the fall. In spring it sports a bright reddish back and black belly; in fall it is a dull brownish-gray. A good year-round field character is its long, drooping bill, which it uses to probe for food in shallow water. The Dunlin breeds across the central and western arctic tundra of North America to Eurasia, and spends the winter primarily along the coasts of the northern hemisphere. Across Tennessee, it is an uncommon but regular migrant, and rare winter resident. It is most likely found from early October to late May, but has been recorded in the state in every month except June and July. Description: This medium-sized sandpiper has a moderately short neck, moderately long black legs, and a moderately long, drooping bill. When foraging it gives a slightly hunched appearance. In breeding plumage (April-August) it has black belly, and reddish-brown back; is dull brownish gray, with a whitish belly in non-breeding plumage (August-March). Immature birds (July-September) have a scaly reddish back, and blackish splotches on the belly. Pectoral Sandpiper has a shorter, straight, reddish bill, and yellowish legs. 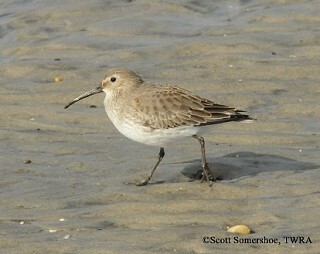 Habitat: In Tennessee, Dunlin use exposed mudflats, the edges of lakes and ponds. Diet: Primarily insects, worms, and mollusks. Nesting and reproduction: Dunlin have never been known to nest in Tennessee. Status in Tennessee: The Dunlin is an uncommon but regular migrant, and rare winter resident across the state. Most likely to be found from early October to late May, but has been recorded in the state in every month except June and July. The Dunlin that breed in northern Alaska migrate to the west and winter along the coasts of Japan and China. The striking reddish back of the Dunlin in breeding plumage gave it its previous name, Red-backed Sandpiper. The first Tennessee state records were in 1936 near Knoxville. The oldest record of a Dunlin was 12 years 5 months old. Warnock, N. D., and R. E Gill. 1996. Dunlin (Calidris alpina). The Birds of North America No. 203. (A. Poole and F. Gill, eds.). The Academy of Natural Sciences, Philadelphia, PA, and The American Ornithologists' Union, Washington, D.C.